Kalihi Valley Instructional Bike Exchange (KVIBE): Spend Your Afternoon with Us at Kaluaopalena Garden! 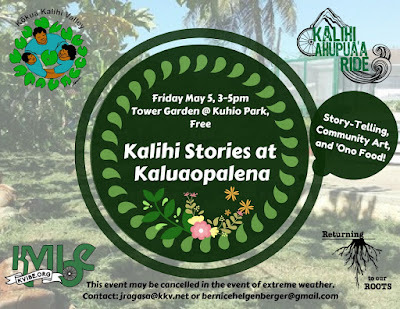 Spend Your Afternoon with Us at Kaluaopalena Garden! KVIBE, Roots Cafe, and KKV's Breathe Kalihi programs are excited to put on our collaborative event, Kalihi Stories at Kaluaopalena. Join us for an afternoon of storytelling and 'aina-based foods on Friday May 5, 3-5pm. It's free of charge to attend and open to the entire community! See you there!